Belle maison AMIBeachClub au nord de la piscine surélevée. Minutes à pied de Pine. 3 chambres à coucher, 2 salles de bains, maison de famille monoparentale privée. Jolie maison surélevée de 3 chambres avec une piscine chauffée solaire au 123 Hammock Road à Anna Maria, à seulement 2 pâtés de maisons de la plage et facilement accessible à pied en 5 minutes. Pine Avenue se trouve à quelques minutes à pied de cette rue calme. La maison a un lit king size avec salle de bain, queen, twin, salle de bains familiale, buanderie, salon / cuisine / salle à manger, salle à manger extérieure, câble, Internet sans fil, téléphone, barbecue et piscine privée chauffée à l'énergie solaire. Tommy Bahama chaises de plage, chariots, parasol, serviettes et une glacière fournie. Noël avec tous les accompagnements! La maison sera entièrement décorée avec un décor de Noël tropical, literie de Noël, serviettes, vaisselle, verrerie et linge de maison. Laissez-moi faire le travail pour que vous puissiez avoir des vacances très reposantes et joyeuses! Je programme normalement mes locations du samedi au samedi. Cependant, il y a des moments au cours de l'année où je peux être en mesure de travailler avec vous pour accepter des réservations qui ne commencent ni ne se terminent un samedi, veuillez donc d'abord m'envoyer une demande. Dès réception de vos dates préférées, je ferai de mon mieux pour répondre à votre demande avec une réponse rapide par email. Si vos dates chevauchent une semaine de vacances, le coût de votre réservation peut être ajusté pour refléter le taux de vacances complet. Envoyer une demande pour un rabais de dernière minute! Beautiful stay in a beautiful home and location! Great location on a quiet street close to the beach. We appreciated the beach chairs and umbrellas and wagon for transporting our gear. Master bed very comfortable! The queen bed is a little soft a somewhat sagging in the centre. We loved the kitchen and cooked in it every night. Really well appointed! We would definitely return and have fallen in love with Anna Maria Island. Thanks Valerie for responding whenever we needed you! First of all the master bedroom king bed is so comfortable! Memory Foam. something my 57 year old back was worried about. all the amenities needed for the beach are there, and the pool is a great big PLUS when the beach is windy. 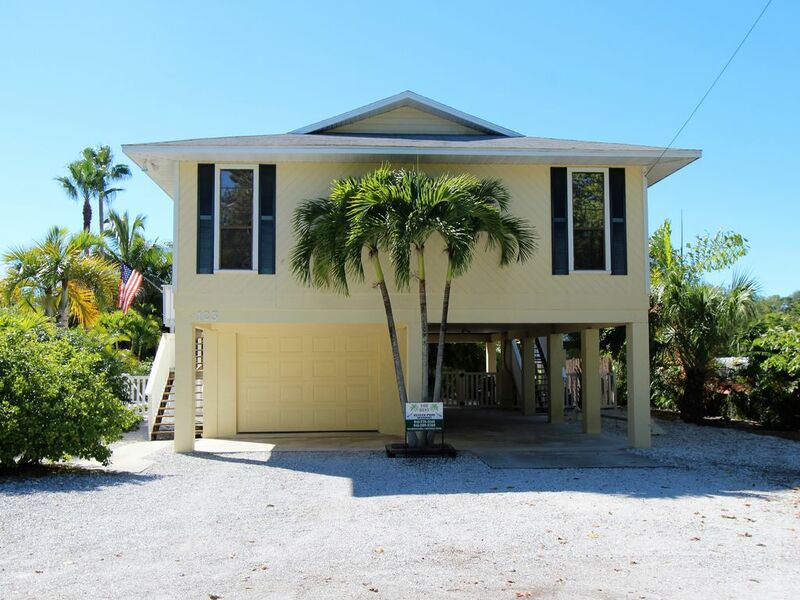 the furniture is comfortable, the location cannot be beat - everything on this special little oasis of Anna Maria is within walking distance. We rented bikes and it was a great way to see to whole town. I have never rented a VRBO so was a little bit surprised that there are virtually no supplies in the house. I guess i was thinking of what minimum is provided in a hotel room: soap, shampoo, body wash, conditioner. You will need to go shopping for virtually everything - TP, clothes washing soap, etc. Other than that little snafu (maybe my assumption was totally incorrect), everything was seamless. Very clean, well maintained and beautifully decorated. Spent a lot of time on the lovely lanai, great for morning coffee or to relax after day at beach. Gorgeous well equipped kitchen and bathrooms. Very quiet neighborhood. All I can say is wow. The house is tucked away in a quiet neighborhood. Beautiful decor inside home. Very clean . The owners went above and beyond to Surprise my Guest for her Birthday . Great memories made here the week we were there. Would love to come back. Perfect place for a beautiful and relaxing getaway! Our family of 5 loved our stay at 123 Hammock! We never wanted it to end. We even ended up extending our stay. We loved the screened in porch for meals and just hanging out. The heated pool was also great for our little ones with numerous pool toys and floating devices. There are plenty of supplies for the beach and wagons to make it easy to take everything the few short blocks to the ocean. They are also very close to several restaurants on pine street. We only used our car to go to the local grocery store, everything else is walkable even with three kiddos. We will definitely be returning to AMI and only want to stay at one of Valerie and Richard’s places! They know how to make you feel at home and make your stay comfortable and easy especially with little ones! We have been visiting Anna Maria Island for over 15 years and wished that we had found www.amibeachclub.com sooner. You couldn’t ask for better accommodation on the Island. The house is in the perfect location - walkable distance to the beach, pier, restaurants and small shops - so you really can enjoy the relaxed island life throughout your stay! The house itself is spotlessly clean and has everything you need, with a lovely beach feel inside. We particularly enjoyed lazing by the pool and having BBQ’s in the outdoor eating area. The host’s Val and Richard are extremely welcoming and easy to contact, with great tips for things to do on and around the Island. Brilliant house and fab hosts, we are looking forward to a return visit !!. Situé sur la côte ouest de la Floride, Anna Maria Island est la barrière entre le golfe du Mexique et Tampa Bay avec des miles de magnifiques plages de sable blanc. Diverses activités de sports nautiques et location de bateaux disponibles. Anna Maria Island a un certain nombre de restaurants charmants. Profitez de longues nuits paresseux, manger la bonne nourriture et du Golfe ou la baie vue imprenable. Anna Maria Island, un petit bijou au paradis.